A report on Tuesday morning by Bloomberg notes that Wistron executives toured Bangalore. During the tour, sources familiar with the matter claimed that the company "shortlisted a few parcels" near the airport for the facility expected to occupy about 100 acres. Assembly of the iPhone SE at the Karnataka Wistron facility began in mid-May. Officials in the Indian government hope the new price for the iPhone SE will drop down by as much as $100 compared to the current local price, though Apple is likely to try and avoid too much of a reduction in order to preserve its margins. Manufacturing the iPhone SE and possibly other devices in India is fulfills number of conditions imposed on Apple as a condition of doing business, along with providing tax breaks. Apple is considering flagship stores in New Delhi, Bangalore, and Mumbai —all three locations where most of India consumers wealth is centered. This is in addition to the Apple Authorized Reseller expansion that Apple was said to be examining in March. 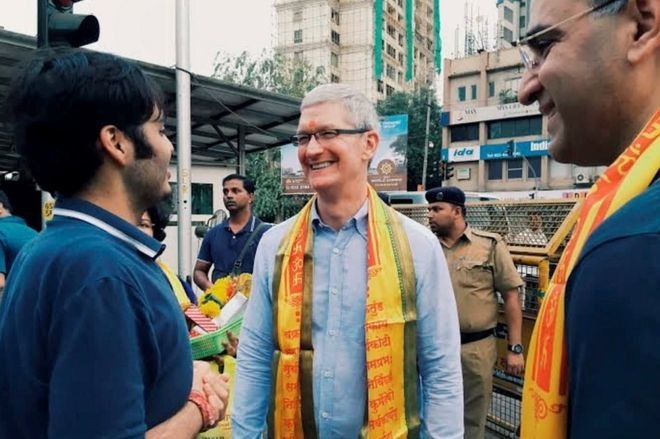 In response to a question at the most recent Apple earnings conference call, Apple CEO Tim Cook said that there was "great momentum" in India, but Apple was still "gaining understanding" of the market.